Mega Power's new Cool Up oil for air conditioners. A/C flush, tune up additive from Mega Power. What you should know about Air Conditioner Compressors. Over time acids, friction, and residues turned compressor pistons to rough, dirty, and sluggish. Those conditions make for friction, much higher compressor temperatures and sluggish warmer cooling. This strain increase drag and requires 5 to 10 horsepower from the engine to work the cooling. This can now be reversed easily...with Mega Power, a tune up oil. Mega Power changes those wear-roughen, dirty and sluggish parts back to smooth, shinny, and peak cooling again. Mega Power tunes the system back to its like-near new cooling efficiency again. Mega Power, following the simple, easy directions below removes the causes of friction and then heals the damage acids and friction caused. Horsepower requirement is lowered. Cooling efficiency cools 5 to 10 degrees cooler. Order Mega Power items listed for this service below. The mechanic tells you a new air conditioner compressor is $550 to $2400 to replace the compressor. Service the engine transmission steering and radiator with Mega Power to lower their friction and horsepower eating drag - along with the compressor. Follow the directions for adding Mega Power to the A/C system below. The entire car should be Mega Power serviced, the real cooling secret for your long time cooling benefits. How I learned the secret. Race car drivers and owners learn tricks that must work in a pinch. This tune up cooling technique is one of them. I learned these tips -from a race car driver. They has saved me, and thousands more from engine transmission and compressor failures - caused by wear, friction, and dirty conditions. The A/C system works by removing hot air from inside your car and expelling it into the air flow cooling your coolant as it passes doing the same in the radiator. Mega Power developed a radiator service that removes scum from the radiator to allow better heat transfer from the coolant. Then Mega Power figured out how to remove spaces in the coolant so more coolant can transfer more heat to the outside spaces. This removes engine and transmission heat levels keeping oil stronger and in a way helping to extend engine transmission life with the Mega Power Radiator Service treatment. Shown below. Mega Power's Radiator Service RS3 Lowers transmission fluid temperatures. A/C air Temperatures. Air conditioner Tune up tips: Servicing and cleaning. Follow the simple air conditioner "cheat" tune up tips service outlined below - you will save your compressor and lower vent temperatures by 5 to 10 degrees. - and if an older, sluggish compressor cooling poorly, this method will revitalizes your older compressor, giving you more years of great cooling life - avoiding costly compressor replacement. Remove the lines and spray into lines, evaporator, and condenser. Followed by blowing soft, low pressure blast of air in one opening to flush and expel harmful, nasty wear-causing residues. Add 4 oz MP#120 and required oil to system and compressor before closing up the system. This is what makes for a foolproof repair and assures the new compressor of a long life. Especially if a rebuilt compressor – which often fail do to poor lubrication. For a A/C cooling system Tune Up. Add 4 oz Mega Power #120 to the system by entree into the low side line – A/c system on and cooling. Both services instantly helps new and older compressors cool better and run cooler. Extends older compressor life. That's what your cars need. Order the items needed below. Follow these simple air conditioner tune up service tips - Can save your compressor. Lowers vent temperatures by 5 to 10 degrees. Directions and tips: Using Mega Power #120 you will provide the only tune up oil and flush cleaner for a compressor I know of. As a flush on a compressor change out, flush the system clean - part by part, by spraying 3 brief sprays of the 120 into each part and blow it out with short air blast into a rag - spray again and blow clean - as stated above. Labor for this flush service is $100 plus compressor oil, seals, filters, coolant, and replacement compressor. The service described offers these advantages. Cools hot running compressors fast. With Leak Detecting glow color. Multi-purpose. Any system. Cost. $15+ $5 s&h= $20 total. 6 pak, $60+ $15 s&h= $75 total. Spray into lines, evaporator, and condenser. Followed by blowing soft, low pressure blast of air to flush and expel harmful, wear-causing residues. Add 4 oz Mega Power as a compressor tune up oil. Instantly helps older compressors cool better and run cooler. Extends older compressor life. Revitalizes avoiding replacement expense. Price of one 16oz. $15+ $5 s&h= $20 total. MP #120 Spray 6 pak, $60+ $15 s&h= $75 total. Mega Power Spray Flush System Cleaner is the smart, fast, and best way to end compressor problems, lower A/C cooling temperature, and extend compressor life. That is because the product combines leak stopping additive, stop leak seal revitalizer, and MC+ friction modifying conditioners. No other product complete the best form of problem ending service like Mega Power. No special Government Permits or Forms needed with these top products. Mega Power Air Conditioner Spray Flush System Cleaner 16 0z #120 usage is an excellent system flush when replacing a failed compressor. The steps using 120 removes metal flakes, acids, sludge to assure meeting new compressor warranty requirements and for a longer life. Both services instantly helps new and older compressors cool better and run cooler. Extends older compressor life. Spray into lines, evaporator, and condenser. Followed by blowing soft, low pressure blast of air to flush and expel harmful, wear-causing residues. Add 4 oz Mega Power plus oil required as an compressor save and tune up. Instantly helps older compressors cool better and run cooler. Extends older compressor life. Other products you should install to help engine cooling, protect the motor and transmission, and extend your vehicles air conditioner dependability. 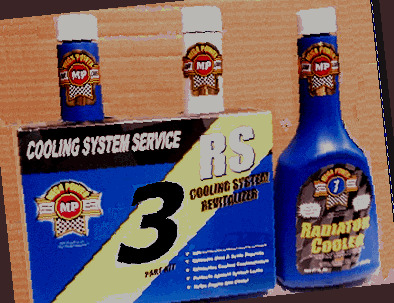 MP Radiator Cool #RC7 12oz. Dissipates heat faster to lower engine/transmission/a/c temperatures. Add to radiator coolant to instantly help engines, transmissions, and A/C units run cooler. Contains: Heat reducing Flush. Non-clog Stop leak. Cool aid. Acid neutralizer. Protector. $29+ $10 s&h = $39 total. 6 pak, $180. Free shipping. Free $12 gift with orders shipped before September 30 2015. Refer to this web page when calling to get the free gift with any product purchase. Consider these air conditioner methods as the total way to protect your car and help cool your vehicles better, longer. Avoid or put-off repair.